A few years ago, my mom planted a little tree in her front yard. Last summer, she had me up on a ladder pruning it back. She didn’t realize when she planted the tree that it was right underneath the power line to her house! Trees and power lines can create problems when they occupy the same space. This can be prevented by planting trees that won’t grow near the lines (are you listening, mom?!). We call it “right tree in the right place.” This might mean planting trees away from power lines, or it could mean planting trees that will not grow tall enough at maturity to reach the power lines. These trees are referred to as understory trees because in the forest they grow under the canopy of taller trees. Some understory species are oriental cherry, crabapple, eastern redbud, hawthorn, Japanese maple, dogwood, amur maple, tatarian maple, serviceberry, silver bell, and tree lilac. When large trees near power lines need to be removed, replacing them with understory trees can ease the loss. A study in Pennsylvania (Flowers and Gerhold, 2000) found that people generally liked the replacement understory trees, and recognized the need to replace older, deteriorating trees with smaller, more power-line friendly types of trees. Understory trees might be perceived as an imperfect solution. People enjoy taller trees that can form a canopy over-arching a street. Taller trees provide more shade and can combat the urban heat island effect. In urban areas where there is little room for tall street trees, there can be more capacity to plant shade trees on private property. Many people have asked me, “Why don’t they just bury the power lines?” It comes down to cost. According to Electric Light and Power, underground lines cost about $1.5 million per mile to set up, which is about five times that of overhead lines. Utility infrastructure is heading in that direction though. All new developments in Connecticut are required to build underground utility lines. It will be a long time until all the lines are underground, if ever, and in the meantime we need to focus on the trees. More information about tree planting around power lines can be found here. Reference: Flowers, D. E., & Gerhold, H. D. (2000, November). 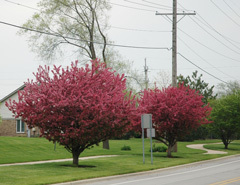 Replacement of trees under utility wires: impacts attitudes and community tree programs. Journal of Arboriculture 26(6): November 2000.